Roger Benoit is a professional entertainment that works in the middle of the magic for 25 years. The performance it offers for children’s parties is designed to showcase the imagination and energy of children. A show, funny and intelligent, full of warm and colorful interactions. Can you make a photo or a video recording of the show? Make sure your batteries are fully charged the night before, the memory of the device is available. Do you Think I should invite their parents to the show? Absolutely! the More people we are , the merrier it is. Not only do they enjoy the show, but they contribute greatly to instill some discipline to the group, just by their presence. And they will volunteer to give you a hand. They will hand the dough for some details such as cutting the cake, refreshments, emergency pee, etc.. This will allow you to have fun too. You wonder how many children to invite? Roger has benefits for groups of 4 as well as for entire schools. There is no doubt that changes the dynamic of the show, but the variability in the number of common. The atmosphere of the event not suffer at all. You do not have to worry about absences and withdrawals, the party will be a success … magical. How much time to allocate party? It depends. A show of 60 minutes, followed by cake and the distribution of gifts, take more than 1 3/4 hours. Wondering what would be the ideal time? The afternoon festivities, from 13:00 to 15:00 on weekends are popular choices. Consider other times, 10:00 noon or 2:00 p.m. to 6:00 p.m.. Remember that many of your guests athletes are often taken on Saturday morning, so consider partying Sunday. A suggestion decor / food? 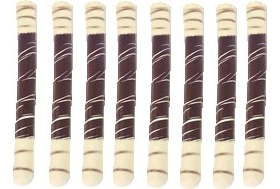 Pretzel sticks, chocolate covered to serve as magic wand disappear very quickly. Prepare for extras, as parents also enjoy ..
Good. I know you’re not on my site for culinary reasons, but I am often asked for suggestions for food or decor, this recipe makes two, and is also a delight for young … and old. It joined the magical theme, it’s easy and fun to do, and you can make them ahead of time with the children. What more?. Cover the baking sheet with waxed paper or parchment. Melt the semi-sweet dark chocolate or chocolate chips in a double boiler. Remove from heat. In spoon, cover the central part of the chocolate pretzels (roughly 3/4), leaving the free ends. Place on prepared cookie sheet. Refrigerate until the chocolate hardens.